We welcome enquiries for permission to perform these works. Scores are available for perusal. Fees are not prohibitive. Prices are for the music scores in pdf format sent by email. Click images of score covers to see details of each work, listen to the music and peruse the poems and libretti and then buy if you wish by pressing a pay button. 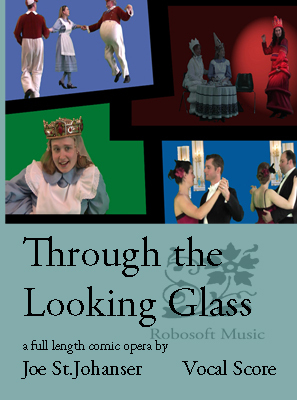 All are eminently suitable for opera companies looking for interesting and not overly challenging contemporary musicals and operas. A subsidy may be available for a quality performance. The music is sophisticated, contemporary (not pop but still sufficiently funky) - not excessively difficult or randomly atonal. Audiences are appreciative of the well constructed drama and the beauty of the music. Cast and orchestra greatly enjoy rehearsals and performances. The works are scored for small chamber orchestras. Cover art by Ronald Marc. Price for the score in pdf format is 8.99 pounds. 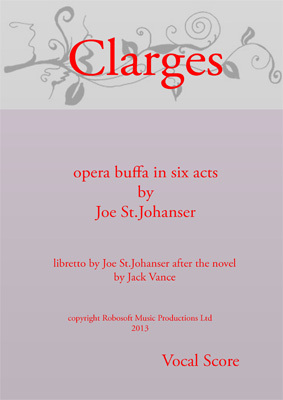 Full score and parts are available in hard copy - please enquire A full length opera buffa in 5 acts. 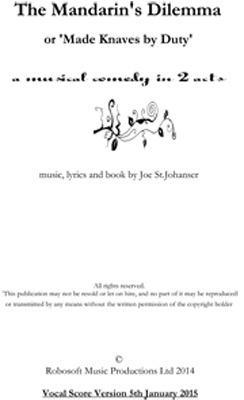 Libretto by St.Johanser after the science fiction novel by Jack Vance. Jack Vance is a highly acclaimed science fiction author. Frank Herbert has called him 'one of the greatest image makers of English letters'. 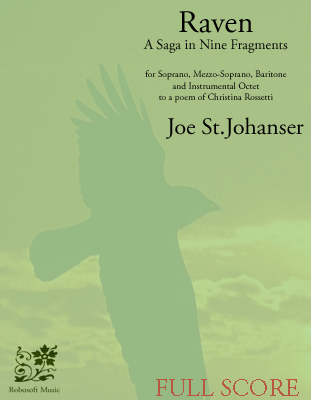 St.Johanser has adapted Vance's 1955 novel as a libretto for his fourth opera, endeavouring to retain Vance's wit, style and imagery and to render in music Vance's unique way of leaving his readers philosophically elevated, calm and filled with well-being. Bit like a fine whisky. This opera is eminently suitable for small opera companies. The music is sophisticated but not excessively difficult. Audiences are appreciative of the drama and the approachable music. The text selected for the libretto is pure Jack Vance - the story largely preserved. The duration of the work is 170 minutes. 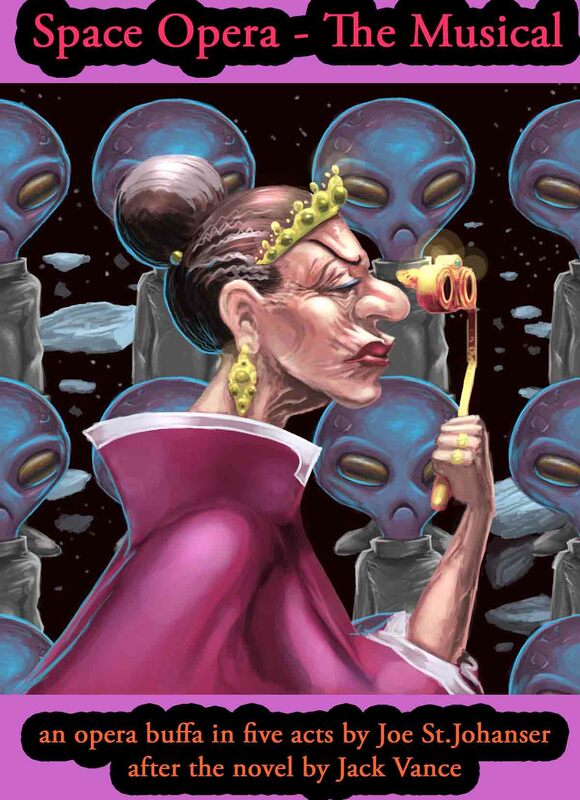 Forces required are 6 principal singers, a chorus of opera singers and spaceship crewpersons and a small orchestra. 'Clarges - the opera' takes its story and characters from the 1956 novel 'To Live Forever' by Jack Vance (1916 -2013), acclaimed Grand Master of Science Fiction. In some far future the nation of Clarges is an island of civilization in a world of primitive barbarism. The civilization has been hard won from the chaos and savagery of overpopulation: caused by the discovery of techniques that conquered the aging process and allowed people to live forever. Population is regulated by the rules of the 'Fair Play Act' and the Actuarian computer. Signing up to gain the benefits of anti-aging techniques is a voluntary act that carries with it a surrender to the decision of the computer as to one's time of death. The benefits of longer life are doled out according to meritorious service for the community. The most worthy become 'Amaranth' and are given immortality. Society is a meritocracy par excellence, which produces mental illness for many who fail to succeed. Price for the vocal score in pdf format is 8.99 pounds. Full score and parts are available - please enquire. Full length grand opera. 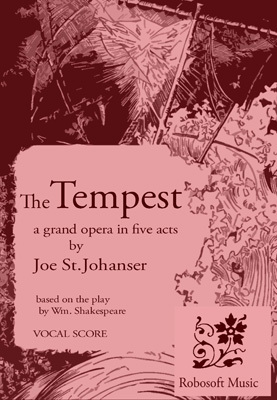 Libretto by St.Johanser from the Shakespeare play. Premiered to considerable acclaim by Guildford Opera 2013. "Everything about this production was excellent" Words and Music. Bravura baritone parts for Prospero, Caliban et al. Ariel is cast as an all-girl trio. All sing fine melodies to Shakespeare's peerless poetry. BALLET - Duration 35 minutes. Eminently suitable for dance schools and ballet companies looking for interesting and mildly challenging new works. The music is sophisticated but not excessively difficult. Audiences are appreciative of the drama and the approachable music. High quality recordings are available for performances without live musicians if needed. Christina Rossetti's strange and famous poem set to music. An interesting and musically thrilling piece with a drama that will interest an audience and offer opportunites for 2 young female principals and a corps de ballet of children of several ages. Price for the vocal score in pdf format is 5.99 pounds. Full score and parts are available. Including the popular Lizzie and Laura duet 'Laura come and kiss me'. Ballet - Duration 15 minutes. Christina Rossetti's strange poem telling of a Princess who travels over the sea to wed her Prince and meets her doom. Set to vocal music and arranged for dance. An interesting and musically thrilling short piece with a drama that will interest an audience and offer opportunites for several principals and a young corps de ballet. High quality recordings are available for performances without live musicians if needed. 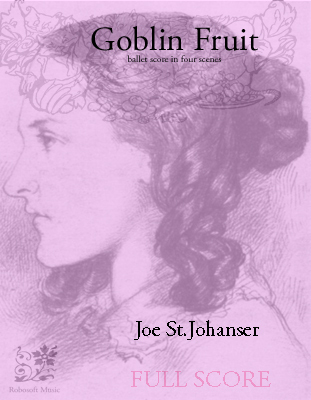 Price for the vocal score in pdf format is 4.99 pounds Full score and parts are available in hard copy. A musical black comedy in two acts. Premiered to excellent reviews by the Nomad Theatre. 'What an excellent production �Mandarin� was. This musical deserves to be staged again in other theatres'. Price for the vocal score in pdf format is 8.99 pounds. Full score and parts and vocal scores are available in hard copy - please enquire.